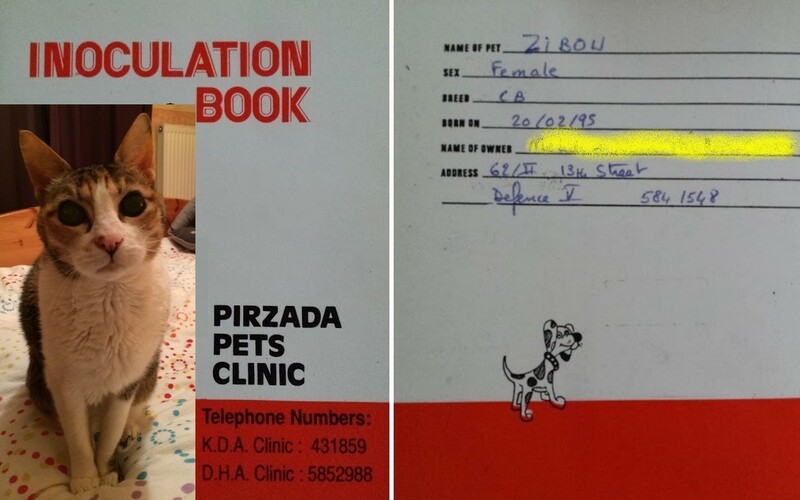 She was born on February 20th, 1995 in Karachi, Pakistan where my then husband, Pooh, and I were living. She was the tiny underfed kitten of a of litter of two. A Pakistani street cat’s life expectancy was of approximately one to one and a half year. They must survive the lack of fresh water, mice, good care and potential stray dogs attacks. To choose one over the other kitten meant letting the second one face certain death. We purchased a baby bottle in which we had to insert a straw in the teat to fit their weeny mouths. We fed them with formula milk every 4 hours. Soon enough, we potty trained them; taught them to lap up, to clean themselves (they grew a real passion for the bath tub or the shower!). There was no cat food available, so I cooked meat and fish for them but we very often had to “stimulate” them as it did not seem to taste that great for their delicate palate… instead, they became fond of cucumbers, melon, yogurt or “romek”, the local cheez whiz. Later on, when we moved back to France, they would always prefer green beans to steamed fish…There was no cat litter so we used cheap rice for their pipi boxes. On December 1st 95, we found another stray kitten. Ratso was a loud baby with a scarred nose and a crocked spine. Having two or three cats meant the same logistic approach, and it was fun to have a real cat with 100% kitty behavior whereas Zib and Lulu were a bit “humanized”. Today, she needs to get slightly more sleep and I know her heart is tired. However, she’s as healthy as can be and and lives a sweet happy life. Tending for a vulnerable blind cat sends me back to her early days… She is the discreet witness of a whole span of my life. Her vet once told me that the love she gets from mer is essential to her willingness to stick around. Let’s begin whith the title. It sounds like a great story, a mix of AngelaZibou , Amelia Lulu and Lawrence Ratso’s epic lives!